Looking almost directly north, Mt H’Kusam towers over the meadow. 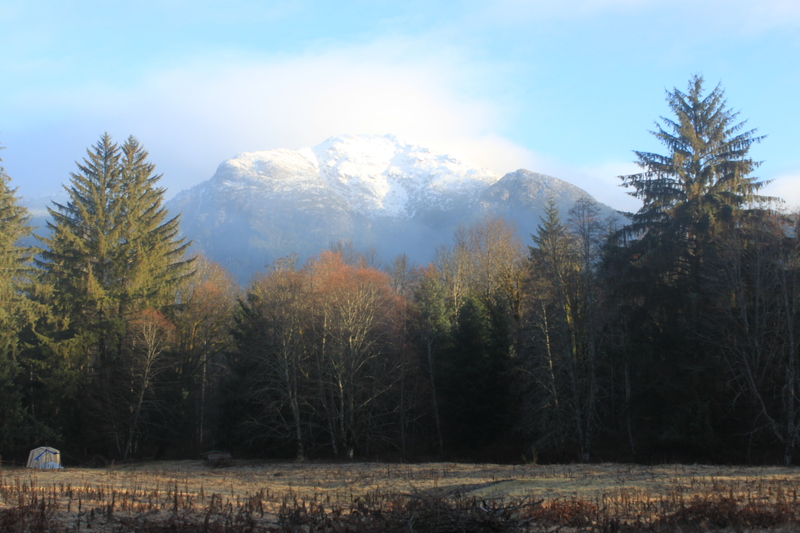 Perfectly framed but the giant Sitka Spruce, it is hard not to focus on this incredible mountain view, and watch it change in all the different light and seasons. And Mt. H’Kusam has many stories. In my brief research this far, I’ve read that H’Kusam is named by the Kwakwaka’wakw (pronounced Kwak-wak-ya-wak) First Nations people meaning “having fat or oil.” This is said to refer to both the Salmon River and the large First Nations village once located on its Southern bank. And I have not seen it yet, but there is a mysterious cloud that appears encircling the top of the mountain, which the Kwakwaka’wakw People called Hiatsee Saklekum, “Where the breath of the sea lion gathers at the blow-hole”. They believed that there was a tunnel through the mountain through which the sea lions’ breath traveled. I have heard locals calling this strange cloud “Oscar.” I think I will have to investigate further. Another story this mountain has is one of strength and endurance. Every year on the summer solstice an event is held called the “Kusam Klimb” This is a race of sorts, or just a personal challenge to hike the 23 kms up and down the back side of the mountain. A typical hiker will take 7-9 hours to do the route, but there are those who go for speed and the winners each year finish the Klimb in 2-3 hours. When the rains come to the valley, our land is at the mercy of the mountain. The rain that falls on H’Kusam soon ends up as our swamp. We watch the snow come and go, and the colours it changes reflecting the sun as it sets. We miss it when the clouds roll in, and aim our binoculars to inspect the distant details. You can see the slides and fallen trees, and we’ve been told that there was a fire on the mountain in the 1950’s or 60’s, but I haven’t found any info on that. What I did find was the story of the great Sayward Fire in 1938 that burned 30,000 hectares of beautiful forest consuming almost 2/3 of Vancouver Island. My friend and neighbour Dave is a retired logger. He has been a great wealth of local Sayward Valley intel; weather predictions, wildlife sightings, gravel sources, and is always willing to help with our big jobs, like fixing the road, lifting beams, moving the bus, and digging the well. He told us about back in the day when he was a faller, working in the area and accustomed to cutting down old growth forests. He said he was at this location for about an hour before he put down his tools and refused to cut. It was simply too beautiful. His fellow workers agreed and together they fought to protect the area making it a provincial park. The park is beautiful. Not unlike the Cathedral Grove tourist destination, except here, the paths look like game trails and the woods are all yours…. And you wouldn’t believe the size of the trees. Maggie never felt so small, and Rita was the gold in the green. Robinwood is on the Salmon River. At this time of year as the salmon are spawning, and with the unmistakeable aroma that goes along with that, the river feels more alive and connected than ever. I was down at the beach a few days ago and all was quiet, and now suddenly there is activity. Salmon jumping, gasping, and struggling over the shallow spots, aiming to get as far upstream as they can before their final gift to the land -fertilizer and food for the creatures that roam the river’s edge and the forest beyond. The Salmon River headwaters begin in Strathcona Provincial Park and it runs about 80 kms before it reaches the ocean in Kelsey Bay near the Sayward Village. Banked by old growth of Sitka Spruce, Western Hemlock and Red Cedar, Cottonwood and Alder, we have about 800 meters of river running the southern border of our land. During the summer, I swim and bathe in the shallow water everyday. I’m able to walk across to the other side, at some point the water just ankle deep. In the rainy season, I don’t even like to get close. The Salmon River fluctuates dramatically with the rains. The main reason it changes so much from day to day and hour to hour is because of clearcut logging along the valley up river. When it rains 70 mm, for example, we can expect the river to rise 2-3 feet within 24 hours. And there’s a dam upriver as well. Basically, a few days of rain create huge changes around here. Standing on the beach below the trees, you can see grass and twigs still lodged in the branches, showing that last winter, the river came a good 10 feet there. So, with the salmon come the bears! Look at these tracks! I followed them a few meters and found this: A big bite out of this guy! And more tracks; signs of the secret life of woodland creatures left in the sand. The ones on the left are from Rita and the bear, but the ones on the right, well, what do you suppose those are from? Raccoon? River otter? I am not sure…. We drove up a road someplace into some woods nearby and found a very diverse kingdom of fungi! Blue ones, orange, purple, pink, red, glowing white and yellow. We found a ton of chanterelles, our bounty was incredible. Chanterelles for breakfast lunch and dinner for days! We even saw a bear! I had brought my camera and it made our 2 hour sojourn in the mushroom moss that much more fun for me. Every tiny spec in the world holds beauty, and the sweetness of the dripping rainforest is full of my kind of treasures.